The Biscuit Burners On Mountain Stage The North Carolina group takes a youthful approach to old-time mountain music, performing on stage and teaching it in classrooms. The band plays from its breakthrough album Mountains Apart in this set. 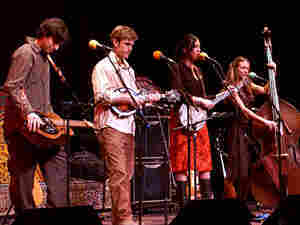 Applying a youthful approach to old-time mountain music, The Biscuit Burners' members hail from Weaverville, N.C. At the time of this 2006 set, the band was on the eve of releasing its breakthrough album, Mountains Apart. Heard here are Mary Lucey on upright bass and lead vocals, Dan Bletz on guitar and Billy Cardine on dobro. Founding member Shannon Whitworth, who shares lead vocals and plays claw hammer banjo, has since departed to pursue a solo career. Jon Stickley, who plays mandolin, often sat in with the group on tour. Their line-up has since changed to include fiddler and vocalist Odessa Jorgensen, who can be heard on the group's latest album, Take Me Home. Individually, the members of the band are in high demand in the studio and on the touring circuit. Bassist Lucey (heard last week playing with Uncle Earl) is a revered songwriter, while dobro player Billy Cardine supplied his talents for the recent solo effort of Sara Watkins (formerly of Nickel Creek). Since 2004, the band has organized the Appalachian Culture Music Program, a series of workshops to teach children about old-time mountain music and how it evolved into the sounds heard today.